We are about to hit the 8 year anniversary of the depths of the financial crisis. Financial professionals like to argue about when the current bull market really started and whether it has actually been through some mini-recessions over that time, but I think everyone can agree it's been a great 8 years to be a US stock investor. As with any extended period of good times there is always that lingering fear among many investors that things can't stay this way forever. I won't get into the details of how the CAPE ratio is calculated but you can see in this chart we are currently well above the long-term average (the red line). 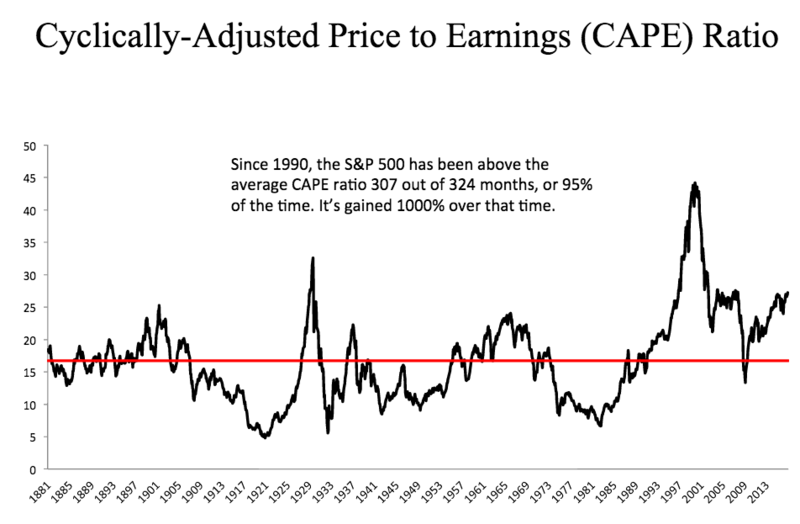 However, what the chart also shows is that since 1990 the US stock market has been above the long-term average CAPE ratio for 307 out of 324 months. During those months the stock market has gained over 1000%! This proves that in the short-term, markets can provide great returns even when stocks are overvalued. Missing out on these returns because you are afraid of valuations can be much more damaging to your portfolio than going through a downturn. My point in showing you this is not to say you should ignore all valuation measures. Instead you should keep your expectations in check for what valuation metrics actually show you. You should not be using valuations or your opinion on current valuations as a reason to jump in and out of stocks or to try to time the market. In the short-term, markets are driven by emotion and can frequently see incredible gains as investors embrace a herd mentality and pile into stocks at the same time. Trying to time when that herd will change their minds is a dangerous and costly game that nobody should attempt to play. What valuation metrics can provide is better perspective on potential long-term future returns. When valuations are inflated, you can expect long-term future returns to be lower than they have been in the recent past. In other words, you should adjust your expectations for the future but you shouldn't attempt to predict the future. We do this for our clients when we work on financial planning projections by adjusting our forward looking assumptions for long-term returns for asset classes that are at higher relative valuations. We don't adjust investment portfolios, just how we think about and prepare for the future. While they can't predict the short-term future, valuations are a perfect illustration of why it's important to be diversified. There are many countries around the world whose valuation metrics look much better right now than those in the US. This is why we advocate so strongly for a broadly diversified portfolio among many different asset classes across the world. If you are concerned about current valuations, step back and look at your overall financial plan. If overvalued equity classes experience below average growth in the future, will your plan still work? That should be the question you are asking yourself, not whether now is the right time to ditch US stocks completely. You should only make changes to your portfolio if your US stock allocation has exceeded your target for that asset class. If that's the case you should look to rebalance the portfolio as part of your regular investment portfolio management. If you need help with this, we are happy to provide advice on your portfolio and urge you to get in touch with us.